Music, rhythms and chants from the ancient African Kingdom of Buganda, nowdays known as Uganda. A medium tempo traditional African field recording, recorded in Eastern Uganda. Features a happy vocal and Nyatiti. 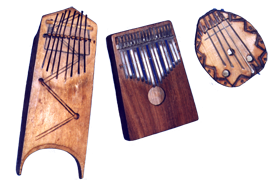 Nyatiti: a stringed instrument resembling something between a harp and a banjo. Frenetic, fast and dramtic - traditional African drumming performed by the Royal drummers of the Kabaka. The Kabaka is the name given to the traditional kings of the Buganda tribe of Eastern Uganda. Recorded in the field.